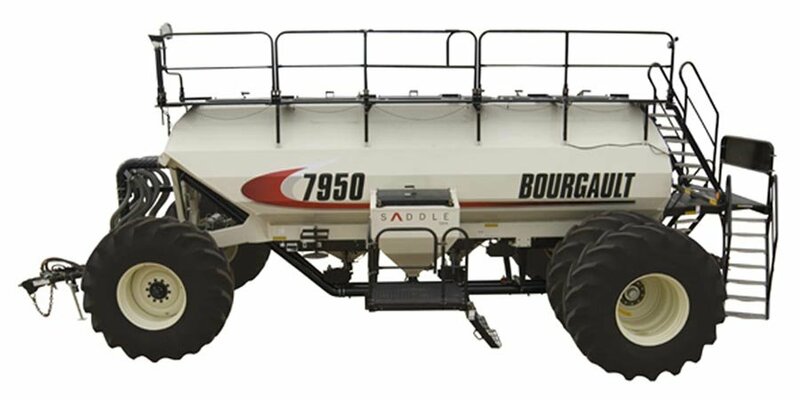 Bourgault continues to provide the most advanced air seeders to farmers with the release of the 7950 Air Seeder. In addition to capacity, the 7950 has many new design features that take it to the next level in air seeder design. The capacity of the Model 7950 is most impressive, with four main tanks totalling 950 bushels (33,477 litres) and full inter-tank flexibility that Bourgault air seeders are renowned for. The optional 40 Bu Saddle Tank & Pallet Storage Platform mounted on the left side of the 7950 is designed for the seeding and storage of bagged product and raises the total tank capacity to 990 bushels (34,887 litres)! The Bourgault Auto Section Control (ASC) system is designed to work with the Topcon X30 Apollo System* to sense when a drill is about to overlap a seeded section of the field. Huge, 850/80R38 radial lug tires require a low 15 psi (103 kPa) inflation pressure, even when operating fully loaded. Compaction is minimal and farmers can continue to fill the compartments even in wetter seeding conditions. The 90" tire diameter minimizes rolling resistance which is important for a tank this size. The 7950 is also equipped with brakes to help ensure safe transportation. The 7950 is available with either a 10" diameter Conveyor with a 15" belt, or a 12" diameter Deluxe Auger. Depending on your priority, 7000 Series air seeders have two different seed application controllers. For those Operators wanting extreme capability, Bourgault offers the ISO/X30 Apollo System*. The X30 Apollo System provides unprecedented control of the 7950. Alternatively, Bourgault offers the ISO Apollo System which provides basic control for those individuals who wish to use the Virtual Terminal in thier tractor. The 7950 comes standard with a stand-alone camera system and a 7” (18 cm) LCD screen. Each tank compartment is equipped with a separate camera to monitor product levels and a rear view camera allows you to watch for approaching vehicles when transporting from field to field. The 7950 Air Seeder incorporates a new hydraulic drive metering system capable of driving up to 5 metering augers.